What would you say if in a few years from now you would not need a power cord to charge your notebook or to deal with those annoying, tangled up cords behind your TV and stereo? Or would you imagine that your PDA or cell phone could be recharged remotely? I would say it is something rather from a more distant future, but research scientists at the University of Tokyo have come up with a unique material that can transmit electrical energy to nearby devices without the need for direct contact. The system is based on a well know phenomenon discovered by Faraday in 1831 – electromagnetic induction – when electrical energy can be transmitted without a contact, just like some electric toothbrushes that recharge while sitting in a plastic charger. Japanese Researcher’s knowhow – a contactless position-sensing system that allows to direct power to wherever the appliance sits . It has a two-dimensional grid of copper coils and a matrix of transistors made from the organic molecule pentacene. Switching mechanism consisting of an arrangement of plastic microelectromechanical system (MEMS) switches, which direct the power to the device. A second two-dimensional layer of copper coils that transmits the energy. 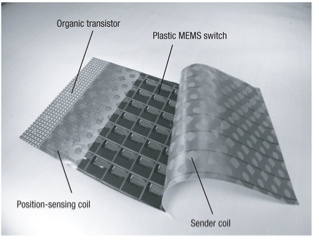 The sheet is 21×21 cm, 1 mm thick, and weighs 50 g. It contains a grid of 64 position-sensing units and 64 power-transmission units. The sheet is capable of providing 40.5 watts of power with more than 80% efficiency – sufficient to operate a small laptop computer. When an electronic device containing a ‘receiving coil’ is next to the sheet, its presence is detected by the positioning coils, and coordinates relayed by the organic transistor circuit. The MEMS switches then direct the power to that point. Actually ,this seems interesting . but my doubt is about how this position sensing can occur ? Also where is the send power? Is it attached to the sheet or in a near place? I’m not sure if Garibald has his MBA but I think he wants us to think he does pointing out everyones mistakes, there is more here than a spelling lesson. 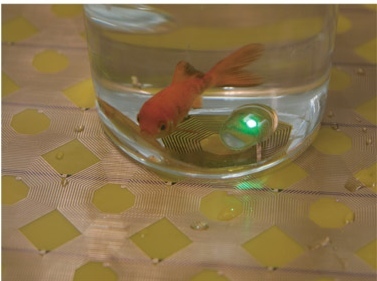 Wireless power is and will be even bigger than the concept of sliced bread or even the light bulb. It is people like Garibald that worry about the spelling and not the big picture that have us in this shape that we are in. It is amazing what can be done if everyone works together. Fascinating article. The writer really knows his chromatography! Pentacene is an polycyclic aromatic hydrocarbon molecule consisting of 5 linearly-fused benzene rings. It has the appearance of a dark-blue powder. It is an organic semiconductor. It is sensitive to light and oxygen. It is a purple powder, but its oxidation product is greenish. Most commercial samples of pentacene are greenish due to oxidized outer layer. Vacuum sublimation or adsorption chromatography are used to purify pentacene. Researchers from Georgia Institute of Technology are developing new approach for using pentacene combined with buckminsterfullerene in solar panels. Pentacene is also a subject of research for use in organic thin film transistors and OFETs. Pentacene is one of a series of linear acenes, the previous one being tetracene ( four fused benzene rings) and the next one being hexacene (six fused benzene rings). I agree with your premise and that the studies would have to be conducted but again, as I mentioned in my comment earlier, here we are neither dealing with high voltage, nor high power – just enough to run your iRobot Scooba cleaner, flat screen TV, cell phone, PDA, notebook computer and floor lamp. My field id electromagnetic design. I can send more power thru the at and go 15 Meters. The effects of such a pervasive power transmission environment on mammals cannot be known until extensive testing is done. Some existing studies show increased incidence of disease in persons living near high voltage AC power lines and of course high frequency RF systems are under continuous study with claims and counter claims of hazard to humans. It has been known for years that you can induce certain brain responses with induction coils so these effects need to be studied. We already live in a world that is pervaded by electromagnetic fields and studies from decades ago found issues with pregnancy and monitor usage that was well documented (lawsuit material). This is a product I would never allow in my home or office until the medical implications are thoroughly studied. why dont they just transmit power by setting up a series resonant RLC circuit with the dielectric being the space between source and load. zero impedance eh? one side effect. it gives your cellphone cancer. do away with wall outlets entirely, embed the material in the flooring and in wall paper, a house without wires! I just put up two pictures from the research paper I hope I am not going to get sued by “Nature” and “University of Tokyo” because I don’t have their permission. Have they tested the effects of the inevitable electromagnetic fields on humans? As far as I know, no, they have not. But this should not be an issue in this case. First of all, these sheets are designed to deliver power only when the electric device is near and because they use microelectromechanical switches, this power is delivered via the grid of copper coils using the shortest path and thus the entire sheet is never fully under voltage. So it when your computer is getting charged via this material, it produces as much EMF as your regular power cord would. Second of all, the currents that can run thru these sheets are relatively small – up to 80 watts. And lastly, the EMF become harmful when their frequencies increase which enables them to travel further. In case of this “tablecloth” power charger we will be dealing with our household grade 60Hz; [Actually I am wrong here it transmits at 13.56MHz] whereas, your cell phone, for example, is around 1900 MHz. Probably a good idea not to wrap one around your head! Is there a risk of damaging the internal circuitry of PDAs, cell phones or laptops? We are entering in a new time period, when more of this kind of innovations will transform the human race. Thank you for this great article. I hope it will be available soon for commercial purpos! Yes, this technology is amazing but there are also limitations. For example, I forgot to stress the fact the power cannot be transmitted over a long distance. The power-transmitting sheets are meant to be like a tablecloth for your desk where you put your laptop or cell phone, or I guess it could be in the floor tiles so your iRobot’s Scooba floor cleaner can always be charged. That’s incredibly, incredibly cool. I really wish my school had a Nature Materials subscription!